The call came when I happened to be nearby the scene of the accident. I was helping my oldest son with a dead car battery after his work shift had ended. As I put the jumper cables back into the car, my cell phone buzzed with a call from Harrison, a friend of my other son Jordan. I knew that they were hiking in the Austin Greenbelt on this Sunday afternoon, and it was strange that Harrison was calling me instead of Jordan. Reeling, but trying to remain composed and get the facts. Paramedics? How serious is this?? A cliff? He fell from a cliff? Harrison gives the specific location as best as he can, and I keep him on the phone as I race toward the scene. While I’m waiting at a red light, the last one before the parking lot of the Greenbelt area, I see a Star-flight rescue helicopter circling overhead, looking like it’s trying to find a place to land. Because Jordan has fallen deep in the dense trails, the emergency helicopter appears to be having trouble finding a big enough clearing in which to land. I park. I run. Through the dense trail and down to the creek bed, I run as fast as I can, frantically looking for the cliffs that Harrison has described while the Star-flight helicopter still hovers overhead. A friend of ours named Stephen, who had happened to be there with his family when Jordan fell, meets me at the creek bed to lead me to the exact spot where Jordan is being treated (click here to read his poignant Facebook post of the incident). There are about a dozen first responders on the scene—firefighters and paramedics—and I can see that have just loaded Jordan into a wheel-barrow looking stretcher with one oversized wheel. Jordan is talking. Not sure if anything is broken but at least he is talking. He is telling me that he is thirsty and asking me if he can have some water. It looks like at first glance he is going to be okay. It’s a good sign when the on-ground paramedics call off the Star-flight helicopter still circling overhead. I look up at the height from which he has fallen and my heart sinks. 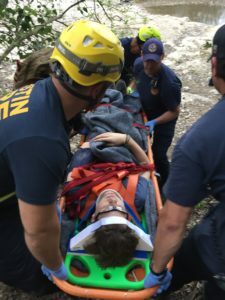 As the paramedics continue to check on him and secure him in the big wheel stretcher, I get more details from Harrison and Stephen’s family on what exactly had happened. As I’m trying to get my questions out one-by-one, the adrenaline that has been flooding by body suddenly subsides and I turn into a crying dad. My friends comfort me. I am so deeply grateful they were there when he fell, giving him aid and not letting him move until the paramedics arrived. As we make our way awkwardly through the trail on the big wheel stretcher, Jordan is full of questions for me and the paramedics (another good sign). Can I have some water? Why can’t I remember falling? Is it okay if I go to sleep for a little bit? We get to the parking area to find a waiting ambulance there along with a news crew. That is a gut punch to see them there with their TV camera, like an official pronouncement of how serious this is (click here to see their report which showed on the evening news…so surreal to watch that later). Hospital ER. Stephanie is on the way. Bruises on his face. Mild concussion. Cuts and punctures. Bandaging wounds. CT scan reveals a fracture on his C5 vertebrae, but no other broken bones or damaged organs. 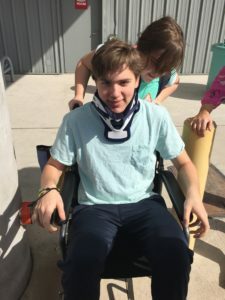 Jordan is embarrassed that he will be a neck brace for 6 weeks while his neck heals, but I am so deeply grateful that it is not way, way, worse. He could have been blind, paralyzed or even gone. We try to piece together exactly how he slipped and fell. Apparently landing on a tree on his back on the way down with his backpack on helped break the fall. Doctors and nurses keep saying how lucky he is. I feel that we are more blessed than lucky. I feel God’s hand all over this incident honestly. I know it’s weird that when people are involved in a horrible accident they always say something afterwards like, “We were so lucky!” Well if you were so lucky, it stands to reason, wouldn’t you not even be in the accident in the first place? The truth is you never know…. ‘Cause we’ll never know when, when we’ll run out of time. That is a haunting truth, not one that makes us comfortable, but it can bring us to a higher place of perspective in life. We look over the edge of that 20-cliff at the rocks below with a rare sense of gratefulness. I don’t ever want to be there again, for sure, but I do want to keep that perspective—of what a gift life is—firmly and forever etched in my mind.